Has your vehicle lost its lustre? Does the paintwork look dull and the colour less vibrant than it was when the car was new? 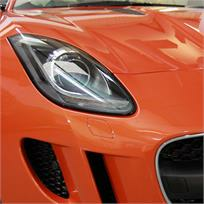 Over time, industrial and environmental pollution and contamination impact the visual appearance of paintwork. Poor wash technique can result in swirls and scratches, damaging the sensitive clear coat finish and causing it to lose gloss. For vehicles with surface swirls and light-to-moderately heavy blemishes such as deeper scratches and swirls, bird dropping staining, a 2-stage Gloss Enhancement Treatment is the answer to restoring the gloss and enhancing the aesthetic appearance of your car. The newly restored finish is sealed using a hydrophobic, UV-resistant and chemical resistant ceramic coating. This will protect your vehicle’s paintwork from loss of gloss and reduced colour clarity typically caused by wash-induced swirls, acid rain etch and UV damage.